The bard’s class skills are Acrobatics (Dex), Appraise (Int), Bluff (Cha), Climb (Str), Craft (Int), Diplomacy (Cha), Disguise (Cha), Escape Artist (Dex), Intimidate (Cha), Knowledge (all) (Int), Linguistics (Int), Perception (Wis), Perform (Cha), Profession (Wis), Sense Motive (Wis), Sleight of Hand (Dex), Spellcraft (Int), Stealth (Dex), and Use Magic Device (Cha). 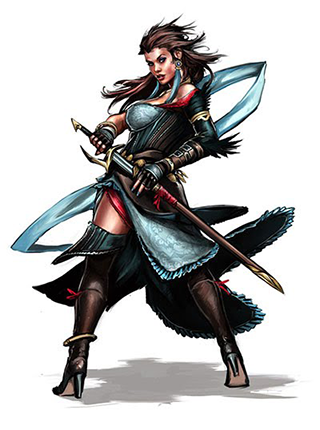 A bard is proficient with all simple weapons, plus the longsword, rapier, sap, shortsword, shortbow, and whip. Bards are also proficient with light armor and shields (except tower shields). A bard can cast bard spells while wearing light armor and using a shield without incurring the normal arcane spell failure chance. Like any other arcane spellcaster, a bard wearing medium or heavy armor incurs a chance of arcane spell failure if the spell in question has a somatic component. A multiclass bard still incurs the normal arcane spell failure chance for arcane spells received from other classes. A bard casts arcane spells drawn from the bard spell list. He can cast any spell he knows without preparing it ahead of time. Every bard spell has a verbal component (singing, reciting, or music). To learn or cast a spell, a bard must have a Charisma score equal to at least 10 + the spell level. The Difficulty Class (DC) for a saving throw against a bard’s spell is 10 + the spell level + the bard’s Charisma modifier. The bard’s selection of spells is extremely limited. A bard begins play knowing four 0-level spells and two 1st-level spells of the bard’s choice. At each new bard level, he gains one or more new spells, as indicated on Table: Bard Spells Known. (Unlike spells per day, the number of spells a bard knows is not affected by his Charisma score (See Table: Ability Modifiers and Bonus Spells). If a bardic performance has audible components, the targets must be able to hear the bard for the performance to have any effect, and many such performances are language dependent (as noted in the description). A deaf bard has a 20% chance to fail when attempting to use a bardic performance with an audible component. If he fails this check, the attempt still counts against his daily limit. Deaf creatures are immune to bardic performances with audible components. Countersong (Su): At 1st level, a bard learns to counter magic effects that depend on sound (but not spells that have verbal components.) Each round of the countersong he makes a Perform (keyboard, percussion, wind, string, or sing) skill check. Any creature within 30 feet of the bard (including the bard himself) that is affected by a sonic or language-dependent magical attack may use the bard’s Perform check result in place of its saving throw if, after the saving throw is rolled, the Perform check result proves to be higher. If a creature within range of the countersong is already under the effect of a non-instantaneous sonic or language-dependent magical attack, it gains another saving throw against the effect each round it hears the countersong, but it must use the bard’s Perform skill check result for the save. Countersong does not work on effects that don’t allow saves. Countersong relies on audible components. Distraction (Su): At 1st level, a bard can use his performance to counter magic effects that depend on sight. Each round of the Distraction, he makes a Perform (act, comedy, dance, or oratory) skill check. Any creature within 30 feet of the bard (including the bard himself) that is affected by an illusion (pattern) or illusion (figment) magical attack may use the bard’s Perform check result in place of its saving throw if, after the saving throw is rolled, the Perform check result proves to be higher. If a creature within range of the Distraction is already under the effect of a non-instantaneous illusion (pattern) or illusion (figment) magical attack, it gains another saving throw against the effect each round it sees the Distraction, but it must use the bard’s Perform check result for the save. Distraction does not work on effects that don’t allow saves. Distraction relies on visual components. Fascinate (Su): At 1st level, a bard can use his performance to cause one or more creatures to become fascinated with him. Each creature to be fascinated must be within 90 feet, able to see and hear the bard, and capable of paying attention to him. The bard must also be able to see the creatures affected. The Distraction of a nearby combat or other dangers prevents the ability from working. For every three levels a bard has attained beyond 1st, he can target one additional creature with this ability. Certain uses of this ability are infeasible, such as Stealth, and may be disallowed at the GM’s discretion. A bard can’t inspire competence in himself. inspire competence relies on audible components. Suggestion (Sp): A bard of 6th level or higher can use his performance to make a suggestion (as per the spell) to a creature that he has already fascinated (see above). Using this ability does not disrupt the fascinate effect, but it does require a standard action to activate (in addition to the free action to continue the fascinate effect). A bard can use this ability more than once against an individual creature during an individual performance. Dirge of Doom (Su): A bard of 8th level or higher can use his performance to foster a sense of growing dread in his enemies, causing them to take become shaken. To be affected, an enemy must be within 30 feet and able to see and hear the bard’s performance. The effect persists for as long as the enemy is within 30 feet and the bard continues the performance. The performance cannot cause a creature to become frightened or panicked, even if the targets are already shaken from another effect. Dirge of doom is a mind-affecting fear effect, and it relies on audible and visual components. Soothing Performance (Su): A bard of 12th level or higher can use his performance to create an effect equivalent to the mass cure serious wounds, using the bard’s level as the caster level. In addition, this performance removes the fatigued, sickened, and shaken condition from all those affected. Using this ability requires 4 continuous performance, and the targets must be able to see and hear the bard throughout the performance. Soothing performance relies on audible and visual components. Frightening Tune (Sp): A bard of 14th level or higher can use his performance to cause fear in his enemies. To be affected, an enemy must be able to hear the bard perform and be within 30 feet. Each enemy within range receives a Will save (DC 10 + 1/2 the bard’s level + the bard’s Cha modifier) to negate the effect. If the save succeeds, the creature is immune to this ability for 24 hours. If the save fails, the target becomes frightened and flees for as long as the target can hear the bard’s performance. Frightening tune relies on audible components. Mass Suggestion (Sp): This ability functions just like suggestion, but allows a bard of 18th level or higher to make a suggestion simultaneously to any number of creatures that he has already fascinated. Mass suggestion is an enchantment (compulsion), mind-affecting, language dependent ability that relies on audible components. Deadly Performance (Su): A bard of 20th level or higher can use his performance to cause one enemy to die from joy or sorrow. To be affected, the target must be able to see and hear the bard perform for 1 full round and be within 30 feet. The target receives a Will save (DC 10 + 1/2 the bard’s level + the bard’s Cha modifier) to negate the effect. If a creature’s saving throw succeeds, the target is staggered for 1d4 rounds, and the bard cannot use deadly performance on that creature again for 24 hours. If a creature’s saving throw fails, it dies. Deadly performance is a mind-effecting death effect that relies on audible and visual components. Bard’s learn a number of cantrips, or 0-level spells, as noted on Table: Bard Spells Known under “Spells Known.” These spells are cast like any other spell, but they do not consume any slots and may be used again. At 2nd level, a bard can choose one type of Perform skill. He can use his bonus in that skill in place of his bonus in associated skills. When substituting in this way, the bard uses his total Perform skill bonus, including class skill bonus, in place of its associated skill’s bonus, whether or not he has ranks in that skill or if it is a class skill. At 6th level, and every 4 levels thereafter, the bard can select an additional type of Perform to substitute. Beginning at 6th level, instead of selecting an additional skill with versatile performance, a bard or skald can choose an advanced versatile performance for one Perform skill he previously selected with versatile performance. Some advanced versatile performance options can be selected only if the bard or skald meets the option’s prerequisites. A bard or skald with an archetype that replaces versatile performance cannot select advanced versatile performance options. Expanded Versatility (Ex): The bard chooses one Perform skill that he has already selected with versatile performance. He adds one of the following skills to the list of skills that are associated with the chosen Perform skill for the purpose of the versatile performance ability: Bluff, Diplomacy, Disguise, Escape Artist, Handle Animal, Intimidate, Sense Motive, or Use Magic Device. This option can be selected multiple times, but no skill can be associated with the same Perform skill more than once. Martial Performance (Ex): The bard chooses one weapon belonging to a fighter weapon group that is associated with a Perform skill he has selected with versatile performance (see below). He gains proficiency with this weapon. If the bard is already proficient with this weapon or later becomes proficient with it, he gains Weapon Focus with that weapon as a bonus feat instead. In addition, the bard’s effective fighter level is equal to 1/2 his bard level for the purpose of qualifying for feats that specifically select weapons from those Perform skills’ associated fighter weapon groups. The types of Perform skills and their associated fighter weapon groups are: Act (close, double), Comedy (flails, thrown), Dance (monk, spears), Keyboard Instruments (hammers, siege engines), Oratory (heavy blades, light blades), Percussion (close, hammers), Sing (close, natural), String (axes, bows), and Wind (monk, thrown). Masterpiece: The bard gains a bardic masterpiece, as if he were giving up a feat to learn it. He must meet the masterpiece’s prerequisites, and the masterpiece must list ranks in a Perform skill that the bard has chosen with versatile performance as a prerequisite. This option can be selected multiple times. Instead of receiving an additional skill rank or hit point whenever they gain a level in a favored class, some races have the option of choosing from a number of other bonuses, depending upon their favored classes. The following options are available to the listed race who have bard as their favored class, and unless otherwise stated, the bonus applies each time you select the listed favored class reward. A good bard can sing the birds from the trees or talk a king into abdicating his throne. A jack of all trades, the bard sees little need to restrict himself to a single talent, picking up a little of this and a little of that, but always with a keen eye for other people and how they might be manipulated, whether through artistic performances or more mundane avenues. Presented below are several classic bardic themes. *Each masterpiece has an associated cost to learn it. Typically, a bard must spend one of his bard spells known of a specific spell level or select it in place of a feat.